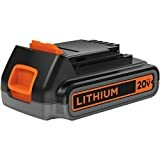 The BLACK+DECKER LBXR2020-OPE 20v Max 2.0 Ah Lithium Battery Pack is designed to be compatible with Black & Decker 20 Volt Max lithium ion cordless tools and outdoor equipment. The 2.0 ah cells allow for 33% more run time than the LBXR20. This battery is easy to install remove and is always ready to go due to the lithium’s battery ability to hold a charge for an extended amount of time. This battery is backed by Black & Decker’s 2 year limited warranty.